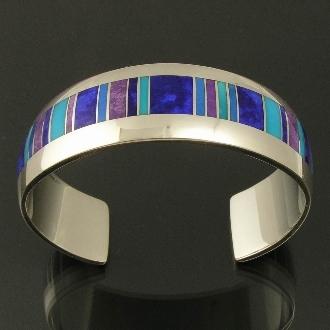 Sterling silver wide cuff bracelet inlaid with lapis, sugilite, cerrulite and turquoise. Handcrafted with a nice heavy weight mounting and top quality inlay materials. Bracelet measures approximately 20mm (3/4 inches) wide with the opening for the wrist measuring 27mm (1 1/16 inches). Inside of the bracelet measures 56mm (2 3/16 inches). Can be custom ordered in larger size for an additional charge. The bracelet is signed "MMH" on the inside by jewelry artisan Mark McBride Hileman.